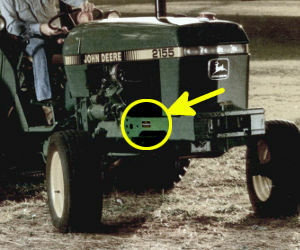 The John Deere 2555 was available in two versions. The basic model has the collar shift transmission, naturally-aspirated engine, 540 RPM PTO, 2WD, and ROPS. With the TSS transmission the engine was turbocharged, PTO upgraded to 540/1000, and it was possible to add a cab and four-wheel drive. Cab: Roll-Gard ROPS. Optional Sound-Gard cab available with TSS transmission.